Tattoo copyright – making its mark? In The Hangover II, Mike Tyson’s famous face tattoo appears on Ed Helms’ character. In 2011, before the film was set to be released, Tyson’s tattoo artist, S Victor Whitmill sued Warner Bros Entertainment Inc, trying to stop the film from being released. Whitmill wanted monetary damages for copyright infringement of Tyson’s tattoo – the original and distinctive tattoo which he created. 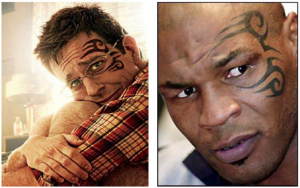 Image: A close-up of Ed Helms, from the Hangover II advertising poster (left) and the original tattoo from a photograph of Mike Tyson (right) for comparative purposes. Source: Verified Complaint for Injunctive and Other Relief by S. Victor Whitmill. “Of course tattoos can be copyrighted”, said the judge in S. Victor Whitmill vs. Warner Bros. Entertainment Inc in Missouri, USA. The judge acknowledged that the court would likely find that copyright infringement had occurred. However, as we know, the film was released and the preliminary injunction was denied. It was held that the public’s anticipation and desire to see the movie, in addition to the monetary loss that Warner Bros would incur outweighed the irreparable harm to Whitmill from losing control of his tattoo. The parties later settled out of court. Can tattoos be protected by copyright in Australia? Yes, copyright automatically protects the creator of ‘original’ artistic works that are reduced to a ‘material form’ (any form of storage of the work). A tattoo, despite being on skin rather than paper, is still in a material form. The tattoo must have required skill and effort to be ‘original’. A generic rose tattoo probably won’t cut it if it lacks sufficient originality. 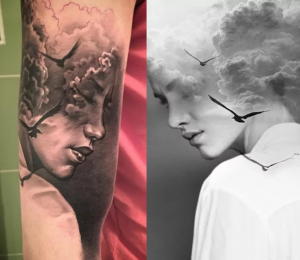 If a tattoo is substantially copied from other copyrighted works, such as photographs, paintings, drawings or text, it will also not qualify as ‘original’. Who owns the copyright in the tattoo? The person that creates the tattoo design is the first copyright owner. This will be the client, if they created the design for the artist to apply to their skin. If the client came in with a photograph or painting however, and wanted it replicated onto their skin, then the photographer or painter will own the copyright. If a client has an idea for a tattoo, but the tattoo artist actually creates the design that is applied, the artist (or possibly the artists’ employer) will own the copyright. When multiple persons have contributed to creating the design, there can be joint ownership in copyright. There may be an exception to the general rule that the creator is the copyright owner. As tattoos are arguably considered paintings, where an artist is commissioned under an agreement to tattoo the portrait of a person onto a client, the client may own the copyright, unless otherwise contractually agreed. However, if the client commissioning the work informs the artist of the purpose for which the tattoo is required, then the artist can legally restrain the use of the tattoo for any other purpose. Image: Left, a tattoo by Matkovski Calin. Right, the art of Antonio Mora, for comparative purposes. Is permission required from the copyright owner to reproduce a tattoo to the public? Generally, yes. Those who wish to publish, adapt, or communicate a tattoo to the public will need to seek the permission of the copyright owner. If they do not, they will be in breach of copyright. LeBron James, Kobe Bryant and DeAndre Jordan are big names in NBA, and feature in the video game NBA 2K16, released by Take-Two Interactive Software. In February, Solid Oak Sketches sued the game makers for reproducing the player’s tattoos in the video game, claiming to have licences over several of the players’ tattoo designs. In 2005, David Beckham’s tattoo artist threatened to sue Beckham if he proceeded with an advertisement which focused on the tattooist’s ‘Guardian Angel’ tattoo. The tattoo artist tried to negotiate a licence agreement, but it all ‘got too complicated’. In the same year, NBA player Rasheed Wallace’s tattoo artist sued Nike and its ad agency for showing Wallace’s tattoo prominently in an advertisement. A settlement was reached before the case made it to trial. In Australia, arguably if a client has paid a tattoo artist to create a tattoo, the client will have an implied licence to display the tattoo. The tattoo artist will retain the copyright ownership, but the client can reproduce the work incidentally through photographs and images of themselves through online mediums such as Facebook, without the permission of the artist, if the social medium is for personal and not commercial use. Is it necessary for clients to seek licences or waivers from their tattoo artists? In 2013, former NFL running back Ricky Williams’ tattoo artist brought a law suit against Williams and EA Games, for using Williams on the cover of their video game, which featured the artists’ tattoo. The NFL Players Association now urges players to obtain copyright licences or waivers from their tattoo artists, to allow their tattoos to be in video games, filmed, photographed and the like! In Australia, if reproduction of the tattoo is for more commercial uses, such as using the tattoo design on t-shirts and other merchandise, or in advertising campaigns that prominently feature the tattoo, an express licence agreement, in writing and signed by the copyright owner of the tattoo may be required. Commercial use may be considered outside of the scope of an implied licence. The law surrounding tattoo copyright is yet to be decided in Australia. However, taking guidance from international cases, tattoos are likely to be the subject of copyright protection, so have a think before reproducing ink.